It's December, which means that there are only 24 days until Christmas! As always Super ONM is embracing the holiday spirit and getting festive. The Christmas 2015 subforum is now open, so go post all of your Christmasy wintry things there. 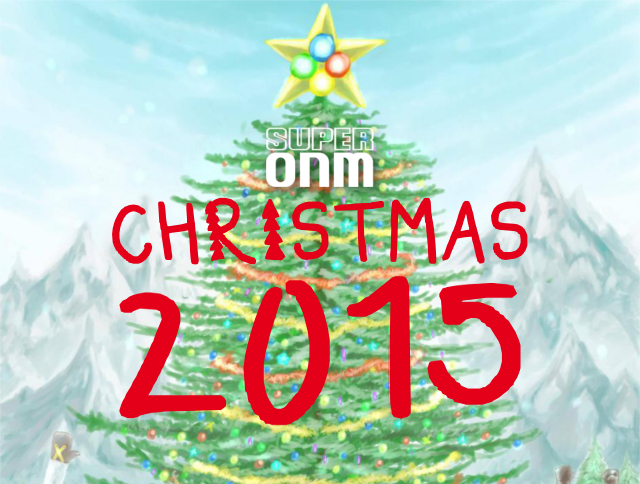 You might have also already noticed our new Christmas banners - switch theme between ONM Classic (or Super Blue) and Super ONM to see the alternate designs! Over in GAAW we are also hosting our annual Christmas community project. This year sees a follow up to last year's format, Countdown to Christmas 2, this time bigger and better with already almost twice the number of contributors. If you're feeling creative then why not join in - of course there will be a profile badge up for grabs for anyone who does so! The banner looks like it says 'I merry christmas from sonm'. Do you not merry christmas from sonm also? Edd wrote: The banner looks like it says 'I merry christmas from sonm'. Because that's what we have to say to strangers when we pass them on the street. This is the beginning of a great SONM Christmas tradition. This reminded me I needed to buy my train tickets home. Also that I'll need to buy gifts. Perhaps it says "1 Merry Christmas from sonm" why only one .. what on earth is going to happen by next christmas? No it means we've had one Merry Christmas from Sonm...this year is the second, so next year it will say "2 merry Christmas from Sonm"
I did for a split second then just see Luigi in my head saying Sonm Christmas no.1! !